Adrian Bradley left his stable job in PR three years ago to embark on a new career in broadcast journalism. His decision paid off and he is now Broadcast Journalist and Assistant Producer at the BBC. As an undergraduate at the University of Birmingham (BA Political Science, 2003) Adrian was involved with student radio. After graduating, he forged a successful career in media relations but held on to his ambition to one day work in a radio. Three years ago, he finally made the decision to quit his job and enrol on a Masters in Broadcast Journalism at City. 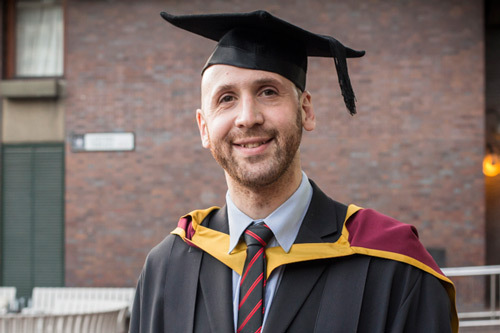 “I knew it was a big step, but at 33 I felt like it was my last chance, like it was 'now or never'"
Adrian completed his studies in 2014 and has worked as a Freelance Broadcast Journalist on radio shows like Woman's Hour and You and Yours on BBC Radio 4, as well as freelance work for ITV London and Guildford station Eagle Radio. He attributes his success to the experience, skills and opportunities gained as part of his course at City. "I absolutely wouldn't be doing what I am today if it wasn't for City. When you're looking for work experience, having City on your CV gets you through the door. The course helped me to practise with the software used by radio stations and I learnt how to put together stories." "We also got to meet with editors from each of the big news stations and work with respected and highly successful journalists like Penny Marshall and Roy Greenslade; experiences that were invaluable. This meant that when I started my work experience placements I could hit the ground running and make a good impression, ultimately leading to me getting freelance work once I'd finished the course."